Well, the day has finally arrived. My girls officially start kindergarten tomorrow. We have spent the last two weeks running around buying clothes, shoes, backpacks, and lunch bags. Now the real chore...figuring out what to pack everyday for a daily snack and lunches. 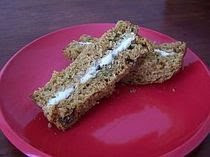 These zucchini bread cream cheese sandwiches are a sweet change from the traditional lunch box fare. These zucchini bread tea sandwiches are also delicious for breakfast or an afternoon snack. Spread two tablespoons of cream cheese on two slices of the zucchini bread. Top with remaining two slices of zucchini bread. Slice lengthwise into "fingers." The Seneca Indians used sunflower seeds to make pudding, gravy, bread, and coffee. Mixed with dried fruit, the seeds also make a sweet and nutty snack. 1. Measure the ingredients into a paper bag, fold over the top of the bag, and shake to mix. Store the mixture in an airtight container. DIRECTIONS: Place ingredients in a food processor fitted with a steel blade and pulse until smooth. Serve with dippers. And don't forget the old favorites like fresh fruits and veggies, yogurt (frozen yogurt tubes will last in a lunch bag) or whole grain crackers. 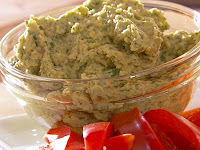 Check out Family Fun and Healthy Eats for more great ideas.